First we'll start with the Atom package system. 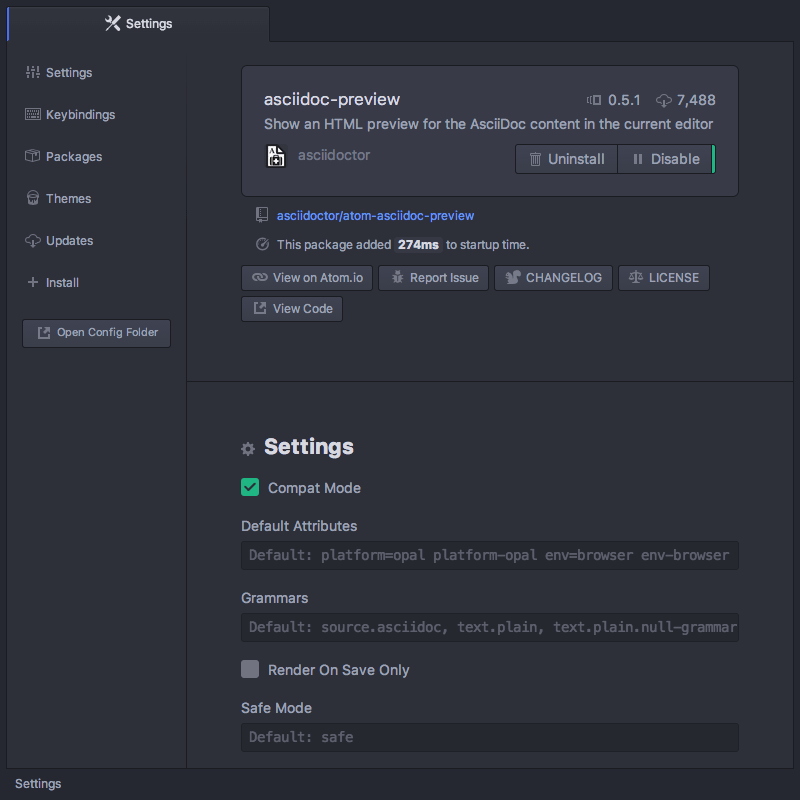 As we mentioned previously, Atom itself is a very basic core of functionality that ships with a number of useful packages that add new features like the Tree View and the Settings View. In fact, there are more than 90 packages that comprise all of the functionality that is available in Atom by default. For example, the Welcome screen that you see when you first start Atom, the spell checker, the themes and the Fuzzy Finder are all packages that are separately maintained and all use the same APIs that you have access to, as we'll see in great detail in Hacking Atom. This means that packages can be incredibly powerful and can change everything from the very look and feel of the entire interface to the basic operation of even core functionality. In order to install a new package, you can use the Install tab in the now familiar Settings View. Open up the Settings View using Cmd+,Ctrl+,, click on the "Install" tab and type your search query into the box under Install Packages. The packages listed here have been published to https://atom.io/packages which is the official registry for Atom packages. Searching on the Settings View will go to the Atom package registry and pull in anything that matches your search terms. All of the packages will come up with an "Install" button. Clicking that will download the package and install it. 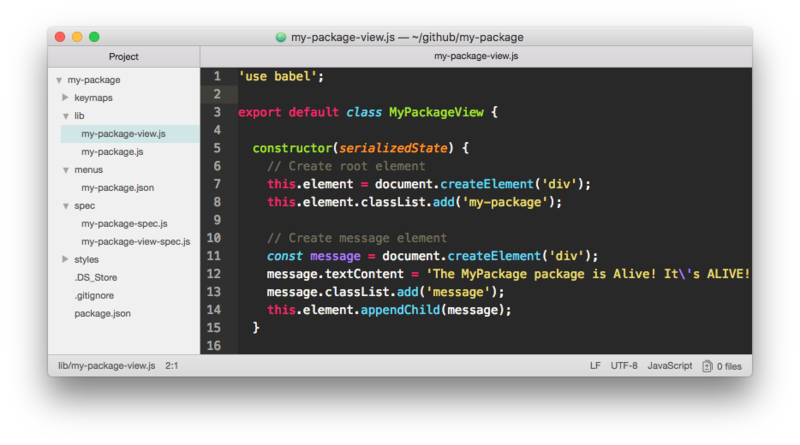 Your editor will now have the functionality that the package provides. 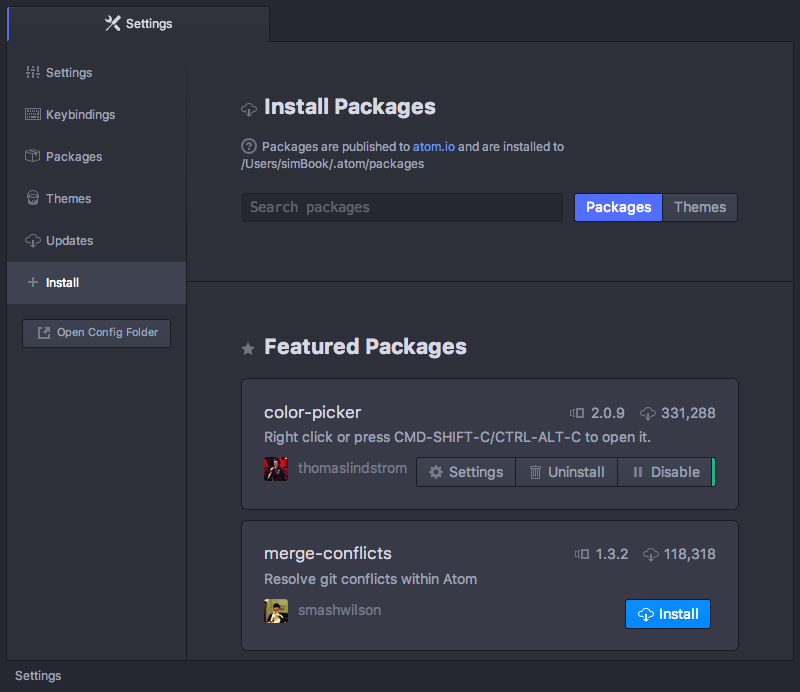 Once a package is installed in Atom, it will show up in the Settings View under the "Packages" tab, along with all the preinstalled packages that come with Atom. To filter the list in order to find one, you can type into search box directly under the "Installed Packages" heading. Clicking on the "Settings" button for a package will give you the settings screen for that package specifically. Here you have the option of changing some of the default variables for the package, seeing what all the command keybindings are, disabling the package temporarily, looking at the source code, seeing the current version of the package, reporting issues and uninstalling the package. If a new version of any of your packages is released, Atom will automatically detect it and you can upgrade the package from either this screen or from the "Updates" tab. This helps you easily keep all your installed packages up to date. 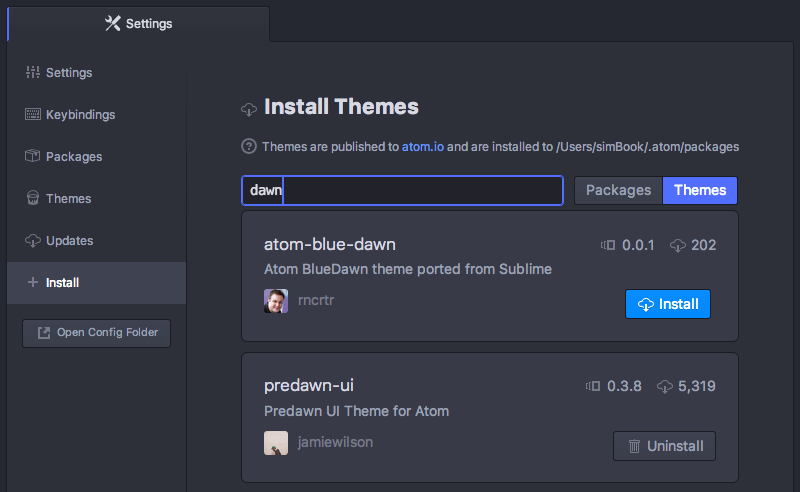 You can also find and install new themes for Atom from the Settings View. These can be either UI themes or syntax themes and you can search for them from the "Install" tab, just like searching for new packages. Make sure to press the "Themes" toggle next to the search box. Clicking on the theme title will take you to a profile page for the theme on atom.io, which often has a screenshot of the theme. This way you can see what it looks like before installing it. Clicking on "Install" will install the theme and make it available in the Theme dropdowns as we saw in Changing the Theme. You can also install packages or themes from the command line using apm. You should see a message print out with details about the apm install command. If you do not, see the Installing Atom section for instructions on how to install the atom and apm commands for your system. apm install <package_name> to install the latest version. apm install <package_name>@<package_version> to install a specific version. For example apm install emmet@0.1.5 installs the 0.1.5 release of the Emmet package. Run `apm install build-coffee` to install this package.